N.B. Prices are indicative and depend on ring sizes, the current gold price, and the current rates of exchange. Contact us for a customized price quotation if you find a set of wedding or clan rings or a piece of jewelry you are interested in ordering. Please do not forget to mention the exact ring sizes in case you ask for a price quotation for wedding rings or clan rings. 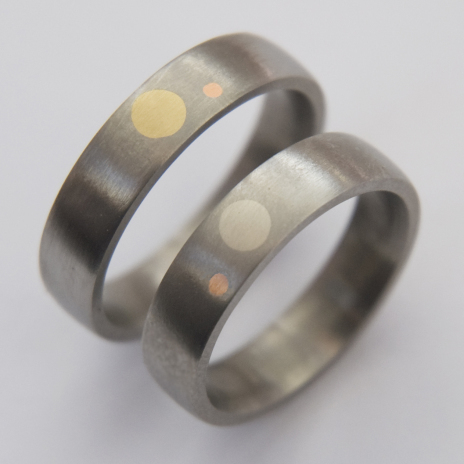 The Anishinaabe title of this titanium wedding ring set, giizhigoo-aadisookaanag, refers to the winter sky and the Spirit Nation that dwells there, headed by Mishoomis Giizis, Wezaawigiizhigookwe Nookomis Dibik-giizis, and anangoog (respectively Grandfather Sun, Yellow Sky Woman also called Grandmother Moon, and the star constellations). The jeweler used gold inlay for the moon and the sun; he did this by hammering round, respectively white and yellow gold, rivet wires into both titanium ring shanks. The star world is symbolized by smaller rivet wire of red gold; in the men’s ring waaban-anang, the morning star, is positioned behind the sun; the ladies’ ring shows ningaabii-anang, the evening star who rises behind the moon.